Does FullStory aggregate Dead Clicks? Yes. With the Dead Clicks searchie, you'll see the button text or CSS selectors where the most Dead Clicks are being triggered. The top Dead Clicks Searchie will appear under your search results and will correspond to your current search query. 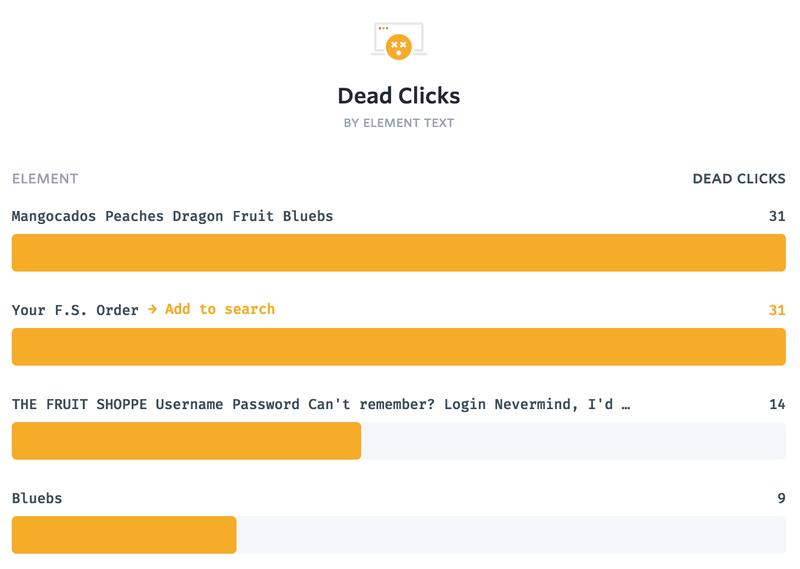 You'll be shown the button text or CSS selector of click events that triggered a dead click along with the number of dead clicks that have been recorded on that text or selector. If a user in your search has dead clicked on the element more than once, each of those instances will be shown in the results. Click on the bars in the graph to add a dead click filter for that element to your current search. Can FullStory show me where customers are experiencing errors? How can I ask questions, report a bug, or provide feedback? Can I share a segment with my team? What is a seat and how many do I get? The FullStory team awaits your every question.